If you're trying to save for your children's college expenses then you may be using a 529 savings plan. The benefit of a 529 plan is that it gives you tax deferred savings and the gains are tax free if used for college. In this sense it works like a Roth IRA in that you use post tax money and then you can withdraw the money to pay qualified college expenses without paying taxes. Sounds good right? However using a 529 for savings isn't necessarily the best option. In fact if you use a 529 exclusively then you may be losing money by missing out on better tax savings via tax credits for college expenses. The key here is that if you use money from a 529 savings plan then it doesn't qualify for other tax benefits like the tax credits. Lets look at an example. For this example I'm going to assume you have a decent income and some pretty good assets so you generally won't qualify for much if any financial aid. Your child then decides to go to the local public college so you "only" have to pay $10,000 in tuition and books. Now lets compare using the 529 versus paying out of pocket. If you'd saved $1000 a year for 18 years and gotten 8% annual growth then you'd have about $37,450 in the 529 plan. You can pull that money out and use it for the tuition bill without any taxes. You pull $10,000 out of that plan to pay the tuition bill tax free. Lets now assume that instead of using the 529 you just put the $1000 a year into a taxable account at Vanguard. You bought a buy and hold index to minimize taxes. Your money still grew 8% and you've still got $37,450. However if you sell those investments you'll have to pay taxes on the gains. The capital gains rate on that would be 15%. 52% of the money in the account is gains. Lets say you wanted enough after taxes to pay for a year of college. You could pull out $10,845 and pay $845 in capital gains taxes and be left with $10,000 after the tax bill. You then use that money to pay for the college tuition. Because of the current American Opportunity Tax credit you get a $2500 tax credit. If you simply avoid a 529 in this situation it allows you to take advantage of the American Opportunity Tax credit which is up to $2500 in tax credit for eligible tax filers. The 529 plan may be tax free by you're giving up a generous tax credit to save a little bit in capital gains. Another example : Lets say you're a single woman working as a teacher in Alabama. You can get a good pay raise and maybe a promotion if you pursue a Doctorate so you sign up for part time classes on nights. Your tuition is going to cost you $5000 a year. You've got a couple years worth of tuition saved up in an account. 529 savings : You put $5000 into a 529 plan last year in order to pay 2013 tuition. The $5000 gives you a deduction on your Alabama state taxes so you save $5000 x 5% or $250 in state taxes. There is no federal tax impact. Tax credits : If you simply left the $5000 in a savings account and then paid out of pocket you'd qualify for the lifetime learning credit. That credit pays 20% of your expenses. In this case thats 20% of $5000 or $1000 in federal tax credit and theres no state tax impact. For this example the 529 savings plan would save you $250 on your state taxes but using the federal Lifetime Learning Credit would save you $1000 on your federal tax bill. Bottom Line: Be careful that using a 529 savings plan for college will make you forfeit even more generous tax benefits available from education tax credits. Recently I wrote the article Disability is the New Welfare. I was discussing an article from NPR on the topic of increased numbers of people on disability programs. One reader named Joan wrote me a couple emails to give her perspective on the topic. The NPR piece seems to really only tell one side of the story and honestly came across a bit biased in that regard. Joan made some good points and I thought it would of interest to hear what she had to say. Joan's entire message is pasted below. The only editing I did was to make direct hyperlinks to some informational sites she referenced and add one comment in italics. Many people are faced with tough choices when allocating their budget and prioritizing different spending and savings goals. If you're in a situation where you are looking at trying to juggle retirement savings or college savings then your own retirement should be the higher priority. If you don't save for retirement then worst case you'll be destitute but if your kid doesn't have savings for college then worst case they won't go to college. You can't get a loan for your retirement yet college can be financed via student loans. Student loans aren't evil and actually have relatively good terms. The kids can always pay their own way if they really need to. Your kids may not even go to college. First lets split people into two groups: Group A has low/mid income and assets. Group B has higher income and/or higher assets. I think that most people I think are going to fall into Group A one way or the other. Half the nation is under median income and in the low/middle income area for that reason and half the nation lives paycheck to paycheck. Group A folks have less money to utilize for retirement or college so they face a valid choice between the two. The key here is that Group A folks ought to be able to qualify for decent financial aid based on financial need. If your family is struggling financially then thats exactly what student financial aid is for. Answer : rely on financial aid for college. If you have higher income and / or higher assets then you won't generally qualify for financial aid. However you ought to be able to save for retirement AND for college. Remember you've got higher income and/or assets... so I don't see a good reason for you to need to make a choice between the two. Answer : You've got money to save for both retirement and college. I know that may be overly simplified but I think this really does cover the situation for most people. IF you're unable to adequately save for both retirement and college THEN you'll very likely qualify for financial aid so retirement should be your priority. ELSE IF you have more money THEN you should really be able to save for both retirement and college. NPR wrote a very interesting article titled Unfit For Work. I'd encourage you to read the whole article. The gist of it is simply : The number of people on disability has risen steadily over the past 30 years. This isn't a unique phenomenon related to the recent recession. "The federal government spends more money each year on cash payments for disabled former workers than it spends on food stamps and welfare combined." Did you realize that? I didn't. "Dr. Timberlake is making a judgment call that if you have a particular back problem and a college degree you're not disabled. Without the degree, you are." This actually makes sense to me. I myself have a back problem. I work a 'cushy' office job where I sit at a desk the vast majority of the time. Yet if I stand for too long my back and leg will start to ache. If I didn't have a college education it would likely be pretty difficult for me to do a lot of blue collar jobs that require 8 hours of standing or repetitive work. Reportedly 80% of adults have back pains at some point in their lives and its probably no coincidence that the #1 reason for disability is back pain. The article shows various charts over time that show relationships between the number of people applying for disability to spikes in unemployment and the comparison of the people on welfare to the people on disability. It seems fairly clear that disability is replacing welfare for many Americans. "PCG [Public Consulting Group] is a private company that states pay to comb their welfare rolls and move as many people as possible onto disability." This makes twisted sense. If an individual is on welfare then the state has to pay money, but if the individual instead gets on disability then the state saves money. Individual states have financial incentive to get their welfare recipients on federal disability. Its clear enough if they're paying a private company $2300 per head to get that accomplished. I don't know what portion of people on disability are severely disabled and what portion have less severe disabilities. I also don't know hat portion of the people receiving disability are actually cheating the system. But even if there isn't outright fraud the system is setup so that if you work in a blue collar job and get unemployed that you may end up on disability due to back pains whereas if you kept your job you'd likely continue to work. Or if you get on welfare you may get 'helpfully guided' on to disability by the state and their private consultant. One of my pet peeves is the claim that the Alternative Minimum Tax is "punishing" the middle class. Or this general assumption that its "only" the middle class that pays the AMT. To my own surprise I haven't discussed this topic previously as far as I can see. I wrote What is Alternative Minimum Tax and How Does it Work a few years ago to discuss the basics of how AMT works. I later wrote Percentage of Population paying AMT that gives the % of population per state that pays AMT. I touched on the fact that only about 2-3% of the entire population pays AMT. If you pull up the IRS tax stats on the topic you can find the amount of AMT paid per income. The figures below are using the latest 2009 figures that I found at the IRS. At the lower income groups you can barely make out some very small slivers of blue. For the groups making under $50,000 less than 0.1% of filers pay AMT. Hardly anyone making under $50,000 pays AMT and very few people making under $200,000 pays it. Once you get to the $100,000 to $200,000 group it hits a noticeable 6.6% but that still a small minority. 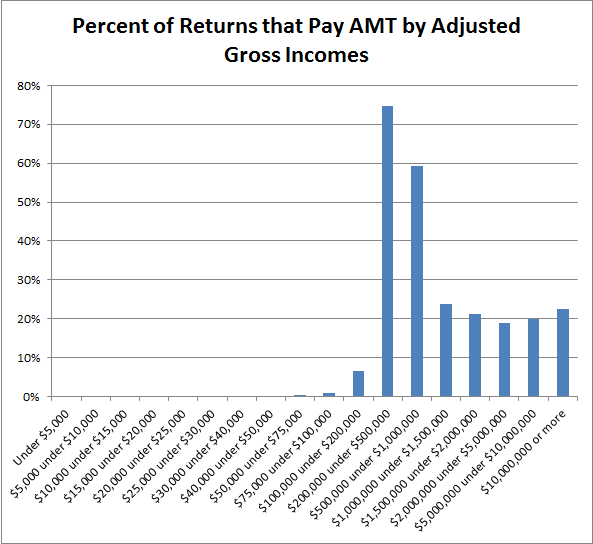 Only when you exceed $200,000 income do you see large numbers of filers paying AMT. 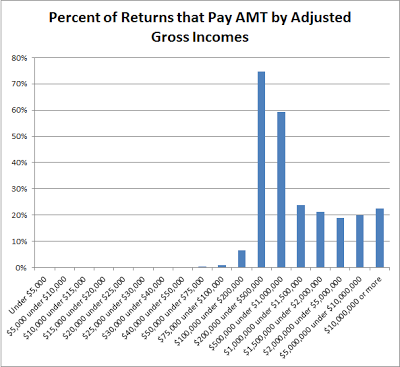 Interestingly the % of filers paying AMT is lower for the people reporting > $1,000,000 of income as you can see its down in the 20% range for those highest AGI groups. I'm not sure why the 7 figure highest income groups pay AMT less frequently than the 6 figure folks. It may be for a number of reasons. For one the top marginal tax rate exceeds the AMT rate so they may simply face a higher tax rate using the standard progressive rates. Or they may be paying more capital gains rather than income taxes. Its also possible that the highest income earners are more likely to use techniques to avoid AMT (or other taxes for that matter). You can not really see the slivers representing the people making under $25,000 or $25,000 to $50,000 but you can see the labels showing 0%. Its not truly 0% but if I went out with 2 decimals you'd see its 0.04% and 0.02% respectively. Clearly the vast majority of people paying AMT and the vast majority of the taxes come from the upper income groups. 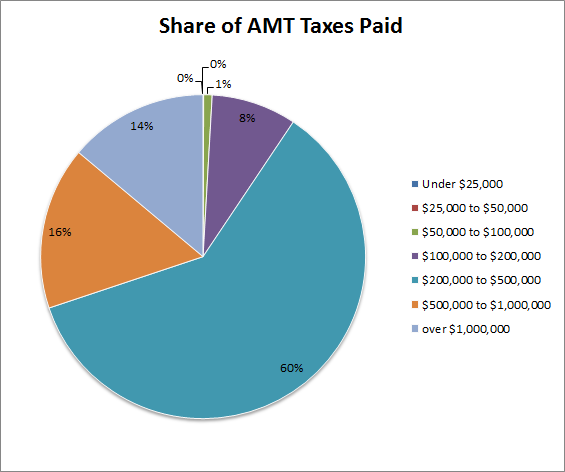 90% of AMT tax revenues are paid by people making over $200,000 a year. Bottom Line : The vast majority of tax filers paying AMT and the vast majority of the tax revenues is from people making over $200,000. I've been stubbornly bearish on gold for several years. For a while through 2010 I was saying that gold couldn't keep going up in price. Then I watched as gold prices broke record after record for years. It now seems though that golds last record is a ways in the rear view mirror. If you look at the chart of gold prices its no longer a steep mountain of success with occasional slight pitfalls but much more similar to a peak that has passed. That does look like the peak might be behind us. If gold were to hit $1000 then that would be about 35-40% drop from current prices. Is that likely or possible? When I discussed the question : How Fast *Could* Gold Drop? "In my opinion then when gold drops next then its pretty likely we could see a drop of about 30% within a 12 month period and potentially 40% losses within a 30 month timeframe." Right now gold is around $1600 which is about 15% off of the peak it hit in 2011. If gold continues to drop further then we could quite easily see it go down 40% from its peak or about $1150 levels within a year. It is quite possible gold could drop to $1000 within 12 months. But I'd caution you about listening to my gold related predictions. I was expecting steep drops in gold about 1.5 year ago when I asked Gold Crashes $100 in a Day... Sign of More to Come?
" I'll go ahead and put myself on record with another prediction on gold prices. 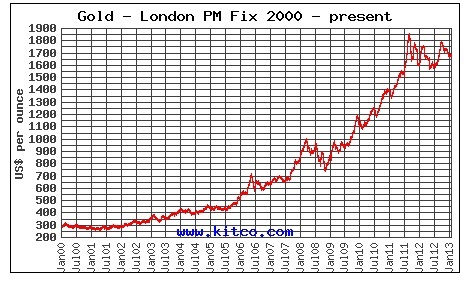 I am thinking gold will drop under $1300 by the end of 2011 and then be under $1000 by the end of 2012. " I was pretty wrong on that one. Gold could still go up today. Look again at that chart from Kitco and notice the slump in prices from 2008 to 2009. In 2008 the price hit about $1000 and then slid around 30% down to around $700. That was a pretty hefty drop around the financial crisis during the Great Recession. Gold could have dropped further then but instead it more than doubled over the next 3 years. Gold could go either way today. It could drop further and sink down to $1000 or even lower. Or it could rebound and go back up again and hit another peak. I would agree with that in general. I would also say that people currently have been buying gold because they want to be on the ride up as its value climbs. I think that the more gold stays stagnant and people see stocks climb faster then the more people will jump off the gold bandwagon. Bottom Line : I'm still bearish on gold and I expect it will drop further. But hey, I'm starting to sound like the boy that cried wolf on this one. Eventually though this broken clock will be right. This is a guest post written by Gary Dek, a personal finance blogger and freelance writer at Gajizmo.com. Gary graduated from a top-ranked university with a finance degree and worked in the industry for 3 years before venturing out to work online. When it comes to bonds, one man's “junk” is another man's high yield investment. High yield bonds offer a better coupon rate than other types of investments because they carry a higher risk of loss. Sometimes the risk to return is better for junk bonds than it is for stocks, though the S&P just returned 16% in 2012. Despite the higher risks, junk bonds are not necessarily a bad investment, especially for smart investors who calculate risk-adjusted returns based on the sustainability of the underlying assets and their respective cash flows. Nonetheless, junk bonds are high yield securities that can be an important part of an investment portfolio, but investors should consider their needs and goals before jumping into this market. As with any investment, there are advantages and disadvantages that need to be considered. Companies issue bonds as a way to raise money, making them, in essence, a type of business loan. The company may need the money to expand operations through capital expenditures such as property, plant and equipment, pay off higher interest debt, or share buybacks. Most companies issue bonds at one time or another, but high yield bonds are issued by companies that have a less than stellar credit rating. The rate of return on these bonds is dependent on the credit worthiness of the issuing company. Because companies in a poor financial position have difficulty attracting investors, they offer higher returns to compensate investors for the higher risk of loss. Higher returns also attract investors who are in a position to take a loss if the company folds. Junk bonds offer a higher rate of income than their more secure counterparts, which is the clearest advantage for high yield investments. In a diversified, fixed income portfolio, junk bonds are a way to achieve higher returns when compared to other safe investment options available. The value of the bond may increase if the issuer's credit rating improves. Investors who believe a company has an unfair credit rating may have identified an excellent investment. Bonds are more secure than common equity shareholders if a company goes bankrupt because they take precedence during a bank liquidation of assets. While bondholders may take a loss, they usually recover at least some of their initial investment even if company stock is rendered worthless. While you may not make any money, you will probably not lose all of your investment either. Another advantage of bonds over stocks is that they provide a consistent income as long as the company does not default and continues to pay the coupon rate. The returns on stocks tend to fluctuate with the market. Some businesses, like discount retail chains, are less vulnerable to recession than other businesses. High yield bonds in a recession resistant company may actually be just as secure as a long term investment in a highly rated company in an industry that is vulnerable to recession. Sometimes, recessions are not the only catalysts for a strong company losing its leadership in an industry. For example, BlackBerry (formerly Research in Motion) was well-known as the leader in business smart phones in the early 2000s. However, their complacence and lack of innovation left an enormous niche in the consumer market unfulfilled, and Apple jumped at the opportunity with an amazing iPhone product. Now, Blackberry is trying to stay alive with a new mobile operating system, but who knows if it will be enough? If Blackberry were not a technology company with no debt, and instead was a highly-levered manufacturing company left behind, chances are, their debt would have been downgraded. As with any high yield investment, the risk inherent in junk bonds is higher than the risk of other investments. Investors who are adverse to risk, or who cannot afford to take a loss should consider the pros and cons of more secure investments like mutual funds or annuities. Since these bonds can be more difficult to sell than other securities, liquidity can be a problem. Investors who want to recoup their investment quickly should probably find financial instruments that can be sold easily. The value of the bond will fluctuate with the company's credit rating. If the credit rating goes up, the value of the bond increases, but if it goes down, the bond may be worth less than the original purchase price. Like all other types of bonds, the prices are also affected by changes in interest rates. If interest rates go down, the value of bonds increase; but if interest rates go up, bonds decrease in value. Additionally, junk bonds are subject to loss of value in a recession when investors run to conservative investments like gold and cash and investment-grade bonds. Since high yield bonds are viewed as risky even in a strong economy, investors believe they are even riskier during periods of recession. The most common and probably the easiest way to buy high yield bonds is through a broker. Both online discount brokers and those with local offices can help you purchase bonds and some will even offer advice on the bonds that are best for your particular needs and goals. You should check to make sure the broker you use has a good reputation and charges a fair commission. Another option is mutual funds that specialize in high yield bonds. Many mutual fund companies buy a variety of bonds (diversification) which offers more security than buying bonds from a single company. Check out the fund's performance and the types of investments they make before deciding where to put your money. Mutual funds may have a fee (load) at the time of purchase, and usually have annual fees for administering accounts. The third way to invest in high yield bonds is to buy them directly from the company and not pay any sales commission. Commercial banks sometimes sell bonds with no commission, but this service is usually reserved for customers with large accounts. Major purchases of bonds can affect their price and therefore their value, so small investors should know who invests in high yield bonds. Pension funds often invest in high yield bonds to increase their earnings, but they usually only invest a small amount of their total assets because government regulations prohibit high risk portfolios. Insurance companies are probably the largest investors in high yield bonds, which they use to fund annuities and other financial products they sell. While mutual funds invest in high yield bonds to an extent, they tend to be more conservative in their investments and limit their exposure. For investors with a tolerance for risk, high yield bonds offer many advantages. It is important to do your homework and only place a portion of you total investments in these high-risk investments. While returns are high, high yield bonds will not necessarily behave like investment bonds and increase in value. The performance of these securities is affected by factors other than the company's rating, like interest rates and general economic environment. Unless you are 100% certain and comfortable with your investment choice, investors should always wait until allocating a portion of their portfolio to riskier alternatives. In the meantime, retail investors can always take advantage of short term investment options that offer greater returns than a checking or savings account. This way, your money is readily available for when you want to take the plunge, but is also yielding more than .01% interest. $10 billion? Really? That seemed odd. Not sure how there would be a $10 billion market for items that probably cost less than 1¢ each. Lets say every single person in America, roughly estimated at 300 million people, eats one loaf of bread every day of the year we'd get 300 million x 1 loaf x 1¢ x 365 or 300,000,000 x 1 x .01 x 365 = $1,095,000,000 or $1 billion. Clearly thats a gross overestimate since we don't eat a loaf of bread per capita daily. But my gross overestimate is already 1/10th the number that NPR cited. Looking at it another way if they're right and the $10 billion dollar figure is correct then that equates to about $33 per year per person, hence my article title. If you're quick you might already notice the problem there. 7.2 billion units were sold. 7.2 billion is 7,200,000,000. The clips or ties cost at most $2.15 per 1000 units. Therefore you can buy 1000 clips for $2.15. We could also say they cost roughly 0.2¢ each. You would need 1000 x 7,200,000 units to cover the market. You can buy that many clips for $2.15 x 7,200,000. or $15,480,000. Thats $15.5 million. Worst case. The market for clips or ties should be closer to $10-15 million. They are off by a factor of 1000. Remember I said the quick folks might have already spotted the problem? Look at the bold/underline parts. 7.2 billion ... $2.15 per thousand ... $10.6 billion. If you just look at the units there billion ... per thousand ... billion you can see their mistake. They're basically taking billions / thousand and getting billions. But the "per thousand" is a division operation and dividing billions / thousand gives us millions. They instead approximated the price somewhere between the $2.15 amount for clips and 80¢ for twist ties so they're guessing average cost of $1.47. Lets look at it another way for a second quick common sense fact check. The entire bakery industry has $30 billion in annual revenues. I think its pretty clear that 1/3 of the bakery revenues don't go to pay for those little plastic clips, so clearly the $10 B figure is in the wrong ballpark. I'm a little surprised that Businessweek would publish an article with a headline based on a math error. I'm also surprised NPR would pick up the story without questioning it. Does it not seem obvious that $10 billion is far too large of a number for something trivial like bread bag clips? Maybe its not so obvious given how numbers like billion and trillion are thrown around daily yet are really hard to grasp the magnitude of them. I'm sure most journalists can do math well enough and we all make occasional mistakes. However it is alarming that a major publication like Businessweek would let a fairly big math error like this get through their editorial process and end up a article title. Its also concerning that other journalists like those at NPR would perpetuate the error without catching it. In the end this one was caught by commenters and fixed on the Businessweek article. Bottom Line: We need to watch and question the numbers you see reported by the media. Chapter 7 bankruptcy is generally the kind of bankruptcy where a company just shuts down and liquidates. While its possible they might be resurrected or bought out and continue business in some form, at this point they are essentially shut down. Their website is still alive and has not notification there but that may be due to the pretty abrupt nature of their bankruptcy filing. Employees were not given any advance warning. Its unclear at this point if merchants will still honor the Entertainment book coupons. In general I see no reason why they wouldn't do so. My understanding is that the merchants don't pay or receive anything from Entertainment to do the coupons so the bankruptcy shouldn't have any direct impact on the merchants. But thats mostly my assumption and what will happen remains to be seen. The answer may very well vary from merchant to merchant. The Dept. of Education statistics has the data on Bachelors degrees earned by field of study. In that year there were 1.65 million Bachelors handed out. I took the degrees and figured the % by total. How many of those graduates do you think are going to face a strong demand for their degrees in the job market? Seems to be around 1/3 or more of the degrees listed won't have particularly strong markets. Krantcents presented The case against paying off your mortgage! Retireby40 agrees with his answer on Should you pay off your mortgage if you could? I agree with the three of them too. When I was a kid we would exchange Xmas gifts with extended family at our grandparents house on Christmas eve. That was the time that we'd get and give gifts between cousins and uncles on my dad's side. Every year inevitably one or two of my cousins would give me a gift that left me wondering why they'd ever think I'd want such a thing. Over the years I got several gifts from a couple of cousins that I had absolutely no interest in. Its not their fault and I don't blame them, I too had little idea what to get them. We simply didn't know each other very well and were taking blind guesses about what a good gift would be. On the other hand the absolutely BEST gift that I'd get on Christmas eve was from my Grandparents. They'd give me a card with cash money inside. It was 100% guaranteed that I'd like that gift and get 100% utilization from it. It wasn't a lot of money, maybe $10 if I recall but it was still useful money I could use to buy something I wanted. Etiquette seems to compel people to buy gifts rather than giving cash. I certainly understand the thinking. You want to give someone a thoughtful gift that shows you care. Slipping a $20 bill into a envelope might imply to people that you actually don't care a whole lot. It makes sense then for the gift giver to want to give a thoughtful gift rather than just pulling cash out of their wallet. But here's the problem... remember my cousins and their awful gifts? Remember my grandparents and the $10 bills that I looked forward to? Sometimes cash is a much better gift than your best effort at gift giving. This is more often true for people you aren't as close with or whom you don't know very well. My cousins and grandparents knew me about as equally well. While my cousins tried to give me a thoughtful gift they simply couldn't know what I wanted and were doomed to fail through no fault of their own. My grandparents on the other hand knew better than try and just pulled out the $10 bill annually. Giving bad gifts is not your plan and usually not really your failing. Its impossible to know the best gift for everyone in your life. Invariably you'll have some more distant relations or even closer relatives who are very hard for you to shop for. Even worse when you give these people a bad gift you've wasted your time to do so and will also likely waste their time. When you give a poor gift you spend your own time to go do the shopping. Then when the recipient gets the gift they may very likely spend their time returning it. You drive to a store and wander around trying to find something good to buy. (1 hour time). Altogether you and the gift recipient can easily spend 2.5 hours giving and returning a gift that shows you don't really know what they want. Worse case: They never return it and sit on it. Personally I don't generally return gifts I dislike. Not sure why, maybe I think its just not polite. In this case the gift recipient ends up with something they get little if any value from. I've had several of those gifts over the years. So not only do I end up with a gift that shows the gift giver didn't know what to give me but I also waste the entire value of the gift by not using it at all. Of course you have to know when to apply this. My wife wouldn't appreciate it too much if I just handed her $50 for her birthday. In some families giving cash may be a total taboo. You of course know your own situation. But if its not breaking a family rule and not for someone close then I'd urge you to consider giving cash for people for who you simply don't know good gift ideas. So please don't buy that distant relative a book on the History of the French Huguenots (for no apparent reason) or buy them some orange towels for their bathroom (in a randomly selected color that may clash with their decor). Instead just give them some money and let them buy the book or towels they'd prefer. Gift cards can be the worst of both worlds. I think they invented gift cards as a way to give a gift without giving cash. It seems like a happy medium for someone who wants to be thoughtful and not give cash but who doesn't know much about what you really want. The problem with a gift card is that you're locking in the recipient into a specific merchant that they might not want to shop at. Its quite easy to get the wrong gift card and that can provide much lower value to the recipient. Then to get around that problem we now have Visa gift cards or other generic cash cards. This to me seems the silliest thing in the world as a gift. Its the gift that says you didn't want to give them cash so instead you paid a fee and gave them a non transferable cash equivalent. Huh? I don't see any value in giving a cash card as a gift over good old fashioned paper money. I guess the one exception is for someone who might want/need to make credit card purchasers who doesn't have a credit card but thats a specific situation. Bottom Line : If its appropriate then don't be afraid to give cash as a gift. You never know you might make some kid happy just like my Grandparents used to. I got the most recent rental vacancy rates for major metro areas at the Census site. Among all the metropolitan areas listed the median is 7.8%. "Vedder, whose study is based on 2010 Labor Department data, says the problem is the stock of college graduates in the workforce (41.7 million) in 2010 was larger than the number of jobs requiring a college degree (28.6 million). That, he says, helps explain why 15% of taxi drivers in 2010 had bachelor's degrees vs. 1% in 1970. Among retail sales clerks, 25% had a bachelor's degree in 2010. Less than 5% did in 1970." So first we have the data points that 41.7M people have college degrees yet only 28.6 jobs require degrees. Based on that we'd conclude that 13.1M people with college degrees are working in jobs that didn't require the degree. Thats 31%. BTW, I'll point out that I previously estimated that 29.1M jobs required degrees which is pretty close to their 28.6M number. The points that 15% of taxi drivers and 25% of retail sales clerks have degrees is sobering. Thats a lot of college educated retail sales clerks and cabbies. Later the article also says 5% of janitors have degrees. I'm not surprised by this data in general. I previously pointed out how almost half of grads regret their major choice. I assume a lot of that is due to the harsh reality of the job market for many of those majors. Now don't take this to mean that college isn't worth it or that you shouldn't go to college. But I think people need to make a hard choice to decide if college is really worth it for them and if they do feel its warranted then make sure to carefully pick a major. Side Note : I don't know why the article title claims 'nearly half' of people are overqualified. Maybe thats covered in the actual study. Retireby40 wonders Should annuities be a part of your retirement plan? One of the big tax benefits of owning rental real estate is the ability to claim depreciation of the property as a tax deduction. This can result in a pretty substantial tax deduction. First lets explain what depreciation means. Depreciation is simply used to account for the loss of value in an asset over time. Its easier to think of something like a car or a washing machine which will wear out over time and has a limited lifespan. Its pretty clear that a car will generally lose value over time so a 10 year old car is worth a lot less than a 1 year old car. For accounting purposes you can write this off as a cost to your business. With equipment that has more than 1 year lifespan they use depreciation to write off the cost of the equipment over a longer period. The depreciation period can vary depending on the kind of equipment. Real property like a residential rental will also depreciate over time. Buildings wear out over time just like anything else. Now this seems upside down because generally the market value of real estate appreciates over time. For depreciation of residential real estate you use the cost basis of the property excluding the value of the land. You do not depreciate land value. You can only depreciate the value of the buildings. In addition to depreciating the building itself you can also depreciation certain types of equipment and capital improvements for a rental. If you add an addition to a rental then you would depreciate the value of the addition as well. Some things like appliances are also depreciated but they use a different depreciation schedule and I'll keep the discussion to the depreciation of the buildings for now. How do you Determine the Value of the Land? Figuring exactly how much the building is worth versus the land may not be straight forward. When you buy a rental you buy the building and land together so you don't necessarily see a value for the land. Appraisals - This is probably the best way to get a value for land. If you get an appraisal then you should have a value in the appraisal to show the value of the land. Property Taxes - A property tax statement may break down the value of the land versus the value of the building. Property taxes work in a variety of ways and are often not a realistic reflection of actual market values. However if your property taxes do break down land versus property then you can use that amount or ratio as the basis for figuring the value of the land when counting deprecation on your federal taxes. Comps - Lastly you could look at the value of a vacant lot of similar size and estimate the value of land in the area. For example if your rental house sits on 1/4 acre and an empty 1/4 acre lot in your area sells for $20,000 then you could use that comp to estimate the value of your land at $20,000. Residential rental property is depreciated over a 27.5 year period. That means that every year you depreciate 1 / 27.5 of the initial property value in a proportional straight line method. So for example if you bought a house worth $100,000 and figured the land is worth $10,000 then the building is worth $90,000. You then depreciate 1/27.5 (or 3.636% ) of that amount each year until 27.5 years are up and you've fully depreciated the property. That would give you a deduction of 90,000 / 27.5 = $3,272.72 per year. You would then depreciate $3272 per year every year that you own the property until you've done so for 27.5 years. Theres is a catch.. You have to Pay it back when you sell. Depreciation is a hefty deduction on your rental income but its not really a free ride. When you sell a rental property you will generally have to pay back the depreciation in the form of depreciation recapture. Recapture is a tax on the depreciation you claimed that you then get back in a sale. Lets say you buy a house for $80,000 and then depreciate it about $14,500 over a few years. You then sell the house for $100,000. You'd have to pay capital gains on the $20,000 increase in value plus you'd have to pay depreciation recapture taxes on the $14,500 that you claimed in depreciation. 1. Depreciation of rental property is a tax deduction that offsets your rental income. 2. The amount you depreciate is the purchase price minus the value of the land. 5. If you sell the property you do have to repay depreciation recapture taxes.